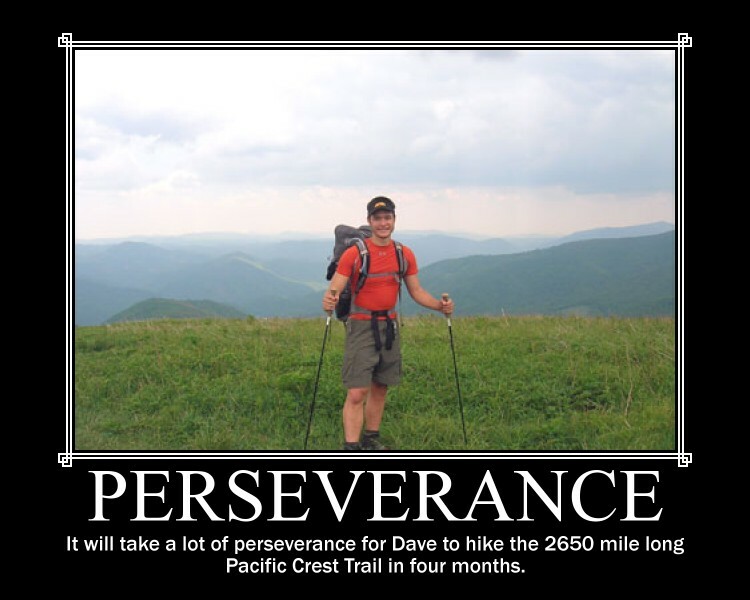 Our inspirational friend, Dave, has a lot of perseverance. In the summer of 2007, Dave, also known by his trail name, "The Comet" hiked the 2175 mile long Appalachian Trail that extends from Georgia to Maine. We followed his blog that he updated regularly with pictures and descriptions of his adventures. When he reached Harpers Ferry, we were lucky enough to have him and his beautiful wife stay with us for a night. This is what he called a "zero day", because he did not hike any miles. We ate, washed his clothes, ate some more, Febreezed his backpack and well, washed his clothes again (P.U.)! We were amazed at his stories and so proud of how much perseverance he had to complete such a treacherous journey. This summer, "The Comet" is going to impress us again. 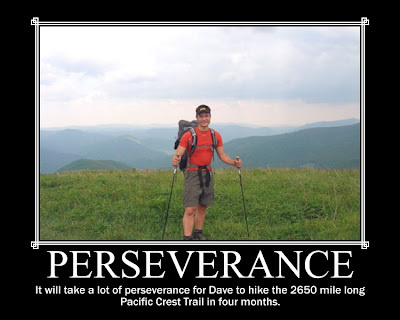 He is attempting to hike the 2650 mile long Pacific Crest Trail. The PCT stretches north from the Mexico border through California, Oregon, and Washington state and ends just across the Canadian border in Manning Provincial Park. Along the way the trail passes through six out of seven North America ecozones, 25 national forests, and 7 national parks. He began on May 22, 2010. If you would like to check out "The Comet's" adventure and be as inspired by him as we are, you can click here to visit his site. He will be updating it regularly, so feel free to drop in and cheer him on with a comment.